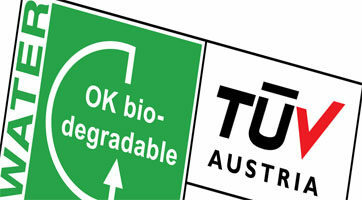 What does OK Biodegradable WATER Certification mean? Products certified for OK Biodegradable WATER guarantee biodegradation in a natural, freshwater environment, and thus substantially contribute to the reduction of waste in rivers, lakes or any natural fresh water. Passes ISO14851 Freshwater Biodegradability testing. A level of >90% biodegradation within 56 days relative to the microcrystalline cellulose control is required to meet the pass criteria. Cosmetic Bioglitter SPARKLE and Deco Bioglitter SPARKLE: are not OK Biodegradable Water certified, however, ISO14851 testing demonstrates we are only 3% off meeting the biodegradability performance criteria to become certified.